This article analyses the reform of the European institutional framework for bank supervision and crisis resolution in the aftermath of the Euro area bank and sovereign crises. The reform aimed at centralizing the decision-making structures for bank prudential supervision and resolution. Mutualization of bank risk is a cornerstone to ensure financial stability and to lend credibility to the Banking Union. To this purpose, the European Stability Mechanism (ESM) – preceded by the European Financial Stability Facility (EFSF) – was created as a mechanism of mutualisation of sovereign risks in the Euro area, which was followed soon after by a clear push toward the centralization of the decision-making structures of bank prudential supervision and crisis resolution. The Single Resolution Fund (SRF), and the single euro area deposit insurance scheme (EDIS) were created as two further Euro area private mutualisation mechanisms in the context of the Banking Union, to cover all banks in the euro area and in future participating countries. Neither the SRF nor the EDIS have the ESM as a fiscal backstop in the steady state as yet. In order to limit moral hazard, mutualization takes place hand-in-hand with burden-sharing with bank private investors in crisis resolution as per the Bank Recovery and Resolution Directive (BRRD). This article also compares the European and US regulatory frameworks based on the ultimate objectives of limiting moral hazard and preserving market discipline in bank resolution. The euro area faced the onset of the recent financial crisis with a decentralized system for bank prudential regulation, supervision, emergency liquidity assistance, deposit insurance and failed bank reorganization and resolution. The safety net had been almost entirely the responsibility of national authorities of each member state in spite of the highly integrated euro denominated money and, albeit to lesser extent, capital markets. The conflicting financial and political interests and objectives reflected a non-incentive-compatible decision making structure (Nieto and Schinasi, 2007) in which national authorities scrambled to support their national banking systems with little consideration of the potential spill-over effects on other European Union (EU) Member States. Since 2010, financial markets have shown recurrent concerns about the debt sustainability in those euro area countries most affected by the banking crisis, which has resulted in a diabolical negative sovereign – bank loop, between banking and sovereign debt crisis. The rise in government spreads mirrored that of the government guaranteed bonds. An analysis of the regulatory framework for bank recovery and resolution as a policy instrument to for limiting moral hazard because the authorities have no other option but to save an institution. The remainder of this article is divided in three sections. Section 2 describes Banking Union and the mechanisms for the mutualization of bank risks. These include: The Single Resolution Fund (SRF); the European Deposit Insurance (EDIS) and the potential role of the ESM to engage in precautionary direct bank recapitalizations. Section 3 presents the new framework for bank recovery and resolution as a policy instrument to limit moral hazard and impose market discipline. This section also highlights the framework´s limitations when banks need to be liquidated. The last section concludes and presents final reflections. This section starts with a very brief summary of the economic literature on the incentives for safety net regulators to cooperate, and of the optimal design of regulation in a multi-country framework. The related literature provides the background for the analysis of the policy decisions that followed the immediate aftermath of the crisis in the euro area, which will be presented in the second part of this section. Before the financial crisis, academics’ interest was initially motivated by the trend towards greater financial market integration in Europe. The financial crisis further intensified awareness of the perilous interconnections among financial institutions and markets. Holthausen and Rønde (2005) argued that prudential supervisors in the EU do not have the incentives to cooperate when their interests do not perfectly coincide. Then, the host country supervisor does not reveal all the information it possesses. As a result, it is not possible to implement the first-best bank closure rule. The authors showed that the better aligned are the interests of the supervisors, the greater is the detailed information that can be exchanged and the higher is the welfare resulting from the closure decision. In this context, they propose supranational supervision as a mechanism to resolve goal conflicts. The supranational supervisor has fewer opportunities to exploit the information that it receives to its ‘own’ advantage than does the home country supervisor who is better informed than the hosts.Eisenbeis and Kaufman (2006 and 2008) proposed principles to ensure the efficient resolution of EU cross-border banks, and Eisenbeis (2006), associated the likely incidence of systemic risk and the negative externalities with the pre-crisis bank resolution procedures in the EU (including deposit guarantee arrangements).Hardy and Nieto (2012) focused on the optimal level of both supervision and deposit insurance schemes, where policy-makers have either similar or asymmetric preferences regarding the profitability and stability of the banking sector.2)Deposit insurance measures the credibly committed and expected amount of assistance (“commitment technology”) that a country may have to deploy to ensure that support for claimants of a failed bank is limited to the predetermined deposit guarantees. We concluded that the first best approach would involve the simultaneous strengthening of prudential supervision and the limiting of depositor protection. Each country, however, has an incentive to “free ride” on the strengthened supervision of others, so an enforcement mechanism is needed. Indeed, strengthening coordinated prudential regulation and supervision is valuable even if deposit guarantee schemes are not well coordinated. Stronger supervision (which can be taken to include enforcement action that requires imperiled banks to take remedial action long before they become insolvent) will reduce the need for deposit guarantees, and help induce countries to limit protection to depositors and other bank creditors.More recently, Schroth (2016) studies optimal supervision of local financial regulators who are better informed about the benefits of lenient regulation. The author concluded that in order to strengthen incentives for local supervisors to share relevant information, they should be supervised jointly, rather than separately. Optimal supervision coordinates regulatory leniency across local regulators within each period. In the immediate aftermath of the collapse of Lehman Brothers, euro area national authorities provided generous financial support to their national banking systems (Figure 1) and focused on preserving their national financial stability with little regard for potential negative spill overs. Supervisors´ behavior was in line with what the literature had predicted, also, its consequences. As a result, financial market integration came to a halt, and even reversed to some extent, resulting in fragmentation and renationalization of the interbank market, of cross border bank lending, and of bank securities holding (Laeven and Tressel, 2014). Furthermore, as the financial crisis began to engulf the sovereign credit standing of an increasing number of euro area countries, the European Council agreed on a credit transfer mechanism within the framework of a macro-economic adjustment program: namely the ESM. Against this background, governments of the euro area gave a clear push toward the centralization of the decision-making structures of bank prudential supervision and crisis resolution. These structures had previously been characterized by an iterative process in which Member States gradually and selectively internalized some of the negative externalities associated with cross-border banking.In June 2012, the EU took steps to centralize supervision and resolution: it created a Single Supervisory Mechanism (SSM)3)Council Regulation (EU) No 1024/2013 of 15 October 2013 conferring specific tasks on the European Central Bank concerning policies relating to the prudential supervision of credit institutions (OJ L287, 29-10-2013). and a Single Resolution Mechanism (SRM).4)Regulation (EU) No 806/2014 of the European Parliament and of the Council of 15 July 2014 establishing uniform rules and a uniform procedure for the resolution of credit institutions and certain investment firms in the framework of a Single Resolution Mechanism and a Single Resolution Fund and amending Regulation (EU) No 1093/2010 (OJ L 225, 29-7-2014) (Henceforth SRMR). This still left two elements of the Banking Union in the domain of national jurisdictions: emergency liquidity assistance and deposit insurance. The underlying economic rationale for such centralization is that euro area public backstops (such as the ESM) could absorb the extreme tail risks of crisis banks only after euro area banks had become subject to common oversight in the SSM.5)As outlined in the Communication from the Commission to the European Parliament and the Council ‘A Roadmap towards a Banking Union’(COM(2012) 510, 12.9.2012), in the Communication from the Commission ‘A Blueprint for a Deep and Genuine Economic and Monetary Union Launching a European Debate’ (COM(2012) 777 final/2, 30.11.2012) and in the Four Presidents’ report ‘Towards a genuine economic and monetary union’ (Report by President of the European Council, Herman Van Rompuy EUCO 120/12, 26.06.2012). However, the ESM has not as yet been made operational to recapitalize banks. At the end of 2015, however, the European Parliament and European Council made a proposal to establish a European Deposit Insurance Scheme (EDIS).6)Proposal for a Regulation of the European Parliament and of the Council amending Regulation (EU) 806/2014 in order to establish a European Deposit Insurance Scheme. COM (2015) 586 Final. Strasbourg 24-11-2015. At present, the provision of Emergency Liquidity Assistance to solvent but illiquid banks in the euro area (ELA) is the only element of the design of Banking Union that will remain a national responsibility. Since the inception of the euro, this main guiding principle of the ECB has not changed. It is the national central bank (NCB) that takes the decision to provide ELA and assumes the credit risk (or a third party acting as a guarantor) associated with providing ELA to a bank operating in its jurisdiction (ECB, 1999).7)See ELA procedures at http://www.ecb.europa.eu/mopo/ela/html/index.en.html (accessed 14 July, 2015).The decentralization of ELA assistance implies that the ultimate credit risk lies with Member States´ fiscal sovereignty. 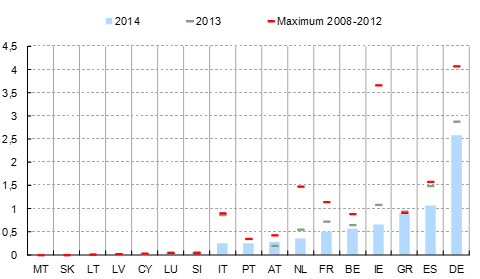 Nonetheless, coordination arrangements are robust because national central banks of the euro area are required to inform the ECB (and to request authorization when the overall size of ELA exceeds certain thresholds) on the financial situation of the beneficiary institution, the systemic implications as well as the terms of the financial assistance including the repayment schedule. In practice, centralization of the decision making on banks’ prudential supervision in the SSM and crisis resolution in the SRB encompasses the active participation of the respective national authorities in the euro area in both joint decision making and execution.8)Banking Union is compulsory for the euro area countries and optional for the rest of the EU countries. The ECB is assigned ultimate responsibility for the effectiveness and consistency of the SSM. The SRB is a euro-level resolution authority, which together with the ECB, as the supervisor, should be able to assess whether a bank is failing or is likely to fail and whether there is no reasonable prospect that any alternative private sector or supervisory action would prevent its failure within a reasonable timeframe. The ECB has a broad range of supervisory responsibilities including, among others, granting and withdrawing licenses; authorization of mergers and acquisitions (M&A) (except in the context of failed bank resolution) and macroprudential policy. However, enforcement is the responsibility of the Member State, which risks inconsistent implementation among the euro area countries. Hence, close cooperation on sanctioning will be needed in order to achieve a consistent supervisory approach as well as a level playing field with respect to compliance and deterrence between the euro area members. The SRB’s decision to place a credit institution in resolution may be overturned by the Council, acting on a proposal by the EU Commission acting on the grounds that it is not necessary for the public interest. Also, the Council may approve or object to material modification of funding by the SRF (see subsection 2.2). Against this background, it could be argued that the Commission may have potential conflicts between two policy objectives of preserving fair competition and protecting financial stability. The SRB will also administer the European Deposit Insurance System (EDIS) (see subsection 2.2). The special tasks of EDIS would require a special composition of the plenary session for decisions that relate to EDIS only. Members representing national resolution authorities in the plenary session of the SRB would be replaced by members representing national designated authorities by the national deposit guarantee schemes.10)Title II of the Proposal for a Regulation of the European Parliament and of the Council amending Regulation (EU) 806/2014 in order to establish a European Deposit Insurance Scheme. COM (2015) 586 Final. Strasbourg 24-11-2015. To the extent that the designated national authorities are members of both the ECB’s Supervisory Board (supervisors) and of the SRB (resolution authorities and national designated authorities of deposit guarantee schemes), their influence cannot be overlooked, hence the importance of both the SSM and the SRB European mandates and governance arrangements in order to allow first best solutions both in normal and crisis situations. Furthermore, the procedure relating to the adoption of the resolution scheme, which involves the EU Commission and the Council, strengthens the necessary operational independence of the SRB.11)In the case of EDIS, however, the decision to assess whether the conditions for the provision of liquidity and loss cover are met corresponds entirely to the Board, which determines the amount of funding. In the euro area, the centralization of the decision-making structures of supervision and resolution came together with (albeit partial) mutualization of bank risks amongst the credit institutions and certain investment firms via the SRF and EDIS. The ESM, which is financed by sovereigns of the euro area, preceded Banking Union. Furthermore, it could be argued that the limitations of the ESM served as a catalyst for the Banking Union.In the immediate aftermath of the financial crisis, EU governments could not agree on a pan- European Government Bond that had been proposed to lend credence to the rescue of the banking system. The political debate focused on the question of the degree of joint guarantees (where every country guarantees everything –i.e. joint guarantee-) vs each country guarantees its own tranche / part (several, no joint guarantee). No agreement was reached. As the banking crisis was negatively impacting the sovereign credit standing of an increasing number of euro area countries and turning into a crisis that was affecting the credibility of the single currency, Heads of State and Government agreed on the ESM to contain the sovereign debt crisis.More precisely, the European Financial Stability Facility (EFSF) was created by the euro area Member States in the context of the Greek sovereign debt crisis in 2010. The EFSF was a (partial) credit transfer mechanism from the investment grade rated sovereigns, which were exposed to first-loss guarantees, to those countries that were losing the investment grade credit ratings and experiencing difficulties in tapping the financial markets. EFSF financial assistance was provided within the framework of a macro-economic adjustment program and financial assistance was subject to conditionality laid out in detail in MoUs. In November 2012, responsibility for providing financial support to euro area Member States experiencing or threatened by financing difficulties was transferred from the EFSF to Europe’s new permanent rescue mechanism, the ESM. The euro area Member States signed an intergovernmental treaty establishing the ESM on 2 February 2012.12)See ESM Treaty at http://www.esm.europa.eu/pdf/esm_treaty_en.pdf (accessed 14 July, 2016).The beneficiary of the ESM financial support must be an Euro area sovereign that can receive assistance in any of the following ways: (1) precautionary financial assistance in the form of a precautionary conditioned credit line or enhanced conditions credit lines; (2) loans or; (3) financial assistance (loans) for the re-capitalization of financial institutions (i.e. no direct bank capitalizations).13)In the case of Spain, it was the first time the instrument of recapitalization of banks through loans granted to a government was used. There were no contributions from other lenders. Spanish authorities requested financial assistance from the European Financial Stability Facility (EFSF) to support the ongoing restructuring and recapitalization of its financial sector. The program concluded as scheduled in January 2014 and the total financial assistance required was € 38.8 bill. The program consisted of 32 measures, which included institutional and regulatory changes that had to be completed in eighteen months. During the crisis, government capital support and funding guarantees benefited bank creditors and helped improve market conditions for sometime, but the banks’ underlying vulnerability to the European sovereign debt crisis has remained. Hence, the ultimate solution for a future banking crisis could not lie in sovereign guarantees or the sovereign-funded recapitalization of banks.The ESM finances itself by issuing short term money market instruments as well as medium and long-term debt with maturities of up to 30 years. Also, the ESM can borrow in the capital markets from banks, financial institutions or other institutions. ESM issuance is backed by its authorized capital stock of EUR 700 bill and the irrevocable and unconditional obligation of ESM Member States to provide their contribution to ESM’s authorized capital stock. An ESM member´s contribution is set by the contribution key agreed in the ESM Treaty, which is the same as the one for the ECB capital subscription. For example, after Greece, Ireland and Portugal entered EFSF programs, contribution keys increased from 27.06% to 29.07% for Germany; from 20.32% to 21.83% for France and from 17.86 % to 19.18% for Italy. This increase in the burden sharing mechanism garnered significant opposition particularly within the financially stronger nations.14)The rise in EFSF spreads relative to the spreads of its Aaa-rated guarantors reflected limits of the EFSF’s ability to support European government bond markets. The movement of the spread of other Aaa-rated euro area countries to Bunds explained only 30% of the increase in the spread on the EFSF issuance. Furthermore, while the EFSF bond spread remained significantly lower than the weighted average spread of all its guarantors, it had moved further away from the AAA guarantors spread and closer to the all-member spread during the last six months of 2011 (Moody´s 2011). The ESM’s loans to Member States enjoy preferred creditor status in a fashion similar to those of the IMF, although the IMF loans enjoy preferred creditor status over those of the ESM. On the one hand, preferred creditor status supports corrective policy programs. On the other hand, it potentially introduces moral hazard into EMS lending decisions when political pressures to lend are strong because it pushes down private creditors in the hierarchy of the priority of claims and increases banks´ cost of financing.15)See Schadler (2014) for an analysis of the IMF preferred creditor status. The other two Euro area mutualization mechanisms (SRF and EDIS) were designed in the context of the Banking Union, to cover all banks in the euro area and in future participating countries. Both the SRF and EDIS are financed by banks and will be administered by the Single Resolution Board (SRB). Neither the SRF nor the EDIS have the ESM as a fiscal backstop. In sum, both were designed as private burden-sharing mechanisms. The SRF ensures that credit institutions of the euro area finance the stabilization of the financial system, in so doing it, mutualizes the risks involved in the efficient application of resolution tools and the exercise of the resolution powers conferred on the SRB. The SRB is responsible for the calculation of the “ex-ante” contributions that finance the SRF. The national resolution authorities are responsible for the collection of contributions from credit institutions and certain investment firms and for transferring them to the SRF. The Board decides on the use of the SRF; however, because Member States are sovereign and decide on fund use in their national budgets, the Board cannot require Member States to provide extraordinary public support to any entity under resolution. The SRF may be used to ensure the effective application of the resolution tools in the context of a bank resolution scheme in order to: (1) guarantee the assets or the liabilities of the bank under resolution; (2) make loans to or to purchase assets of the bank under resolution; (3) make contributions to a bridge institution and an asset management vehicle; (4) make a contribution to the institution under resolution in lieu of the write-down or conversion of liabilities of certain creditors under specific conditions (bail-in tool); (5) pay compensation to shareholders or creditors who incurred greater losses than under normal insolvency proceedings so that they will not be worse off in resolution than they would have been under liquidation. The SRF (as well as the national resolution funds) shall not be used to absorb the losses of an institution or to recapitalize an institution. In exceptional circumstances, where an eligible bank liability or class of liabilities is excluded or partially excluded from bailing-in, the BRRD leaves open how Member States would fulfill its commitment. The BRRD has set conditions and limits on the extent to which the SRF might be used: Contributions from the SRF cannot exceed a maximum of 5% of total bank liabilities including own funds and then only after at least 8% of the total liabilities including own funds of the bank under resolution have been bailed in. Limitations and restrictions on the use of the SRF (as well as national resolution funds) aim at limiting the moral hazard that may derive from the mutualization of risks. Still, moral hazard behavior could materialize, for example in funding decisions that gravitate toward using categories of funds that are exempt from bail-in, such as repos. The moral hazard risk associated with the mutualization is limited, however, by ex ante bank fee contributions, which adjust for both idiosyncratic and systemic risks. Moreover, the ex ante fee contributions limit moral hazard by requiring all institutions to contribute. Ex post levies do not address moral hazard because they exclude contributions from those banks that receive resolution funds. In addition, ex post contributions to the resolution fund to recover the costs of financial crisis would be pro-cyclical, because premiums would be collected during the economic downturn. Premia are typically lower in good times and higher in bad times. Schoenmaker (2010) argues that an insurance fund is typically pro-cyclical. That funding for the SRF will be collected over a sufficiently long period of time (until 31 December, 2024) further limits concerns over the SRF pro cyclicality. Consistent with the objective of limiting the risk of moral hazard associated with mutualization, the liability of each participating Member State within the SRF is separated. That is, it is not joint and several. Hence each of the participating member states responds only for its reimbursement obligation. In the case of contributors for cross border bank resolution funding, recourse to all contracting parties in the SRF is much protected. It is made so by the Intergovernmental Agreement (IA) that requires, first, financial recourse to the national compartments of the SRF.16)Agreement on the transfer and mutualization of contributions to the Single Resolution Fund. If such funding is not sufficient, the IA envisages recourse to all contracting parties (mutualized part of the SRF – full mutualization will take place only after 8 years starting 2016). If not sufficient to finance resolution tools, recourse will be made to the remaining financial means of national compartments. If not sufficient, the IA envisages extraordinary “ex post” contributions from banks of the Member States where the cross-border bank is incorporated. If “ex post” contributions are not immediately accessible, the SRB will decide on temporary transfers between compartments of the SRF that are not yet mutualized, up to a maximum of 50% of existing SRF funds (the SRB will decide on the terms and conditions). The SRB´s decision should exclude financing from contracting parties that object based on a number of reasons contemplated in the IA. For example, the objecting Member State might consider that it will need those financial resources in the near future or the objecting Member State might consider that the borrower does not have the financial capacity to pay back the loan. These are among the reasons envisaged in the IA. During the transition phase, some special financing arrangements have been put in place in order to enhance market and investors’ confidence should the scenario of a large crisis leading to the depletion of the SRF’s resources from multiple resolution procedures arise. In this situation, Member States participating in the Banking Union have agreed to put in place a system of bridge financing arrangements in order to ensure sufficient funding to the SRF during the transition period.17)See http://www.consilium.europa.eu/en/press/press-releases/2015/12/08-statement-by-28-ministers-on-banking-union-and-bridge-financing-arrangements-to-srf/?utm_source=dsms-auto&utm_medium=email&utm_campaign=Statement+on+Banking+Union+and+bridge+financing+arrangements+for+the+Single+Resolution+Fund accessed 10th August, 2016. Starting in 2016, each participating Member State enters into a harmonized Loan Facility Agreement with the SRB that will provide a national individual credit line to the SRB to back its national compartment in the SRF when funding shortfalls follow from the resolution of banks with headquarters in the Member State concerned. The maximum aggregate amount of the credit lines of euro area Member States will amount to EUR 55bn.18)The aggregate amount and the repartition key will be reviewed by the end of 2017 or earlier, if a non-euro area Member State joins the Banking Union. The individual credit lines are to be drawn on as a last resort, after having exhausted all other financing sources, including bail-in requirements under the BRRD as well as the SRB’s external borrowing capacity (as described above in the IA). Such national individual credit lines to the SRB are designed to be fiscally neutral over the medium term. The banking sector of the Member State concerned will be liable for the repayment of the amounts drawn under the credit line. Deposit guaranteed schemes had been a neglected dimension in the coordination of national safety nets until recently. In the EU, deposit guaranteed schemes (DGS) aim at reimbursing depositors of wound- up banks, but they can also contribute to resolution by reducing the likelihood of future claims on the DGS. The credibility of DGS in enhancing confidence and preventing bank runs is paramount. Moreover, both the monetary union and the Banking Union demand that deposits inspire the same degree of confidence regardless of the Member State where they are located (Schoenmaker and Wolf 2015). Historically, EU Directives on DGS imposed only a minimum conformity regarding authority; powers (only paybox or paybox and resolution), premiums paid by banks, time period to pay insured depositors when their deposits become unavailable and sources of additional funding, etc. The financial crisis instigated further harmonization of national regimes by, for example, introducing risk-based premiums. Nevertheless, harmonization merely facilitates coordination and it is insufficient to break the negative loop between sovereign and banking crisis. Only recently, in the so called five presidents´ report on the future of EMU, did policy makers identify deposit insurance as one of the main areas of the Banking Union still pending completion and then proposed to launch a single euro area deposit insurance scheme: the EDIS.19)European Commission (2015) Completing Europe´s Economic and Monetary Union Report by J. C. Junker, D. Tusk, J. Dijsselbloem, M. Draghi and M. Schultz. The EDIS will provide the respective national DGS with the funds it needs to meet its funding obligations if there is a payout event20)The payout event could be the result of a “liquidity shortfall” or a “loss cover” of the participating DGS. 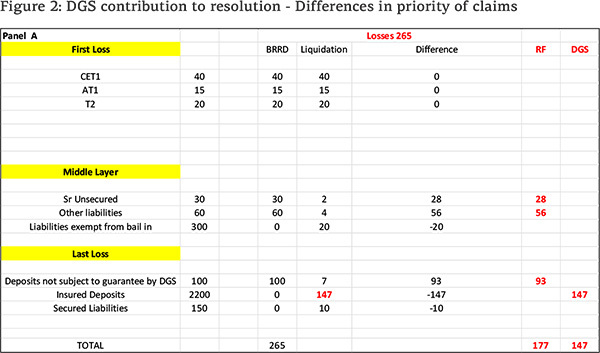 and/or DGS needs to contribute to a bank resolution.21)When using resolution tools (bail-in…) for the amount of losses that covered depositors would have suffered, if they would have suffered losses in proportion to the losses suffered by creditors with the same level of priority (i.e. unsecured debt) under normal insolvency procedures. The liability of DGS shall not exceed the losses it would have incurred under normal insolvency. The Commission proposal provides for a progressive mutualization of contributions and an increase in the share of depositor payouts, which will be funded by the EDIS:22)Proposal for a Regulation of the European Parliament and of the Council amending Regulation (EU) 806/2014 in order to establish a European Deposit Insurance Scheme. COM (2015)686 final. 2015/0270 (COD). Strasbourg 24.11.2015 (Article 41q). (i) During three years starting in July 2017, a reinsurance scheme will also cover up to 20% of any liquidity shortfall (the remaining 80% will have to be paid back by the national DGS). It will also cover up to 20% of the excess loss of the national DGS whenever payouts and losses exceed the DGS´s available financial resources. (ii) Following the reinsurance phase during the co-insurance phase, DGS´s liquidity needs are progressively co-insured (but they need to be repaid) and losses are to be shared pro rata for four years until 2024.23)20% in year 1; 40% in year 2; 60% in year 3; 80% in year 4. This happens whether national DGS resources are exhausted or not. (iii) After seven years, the DGS are fully insured. 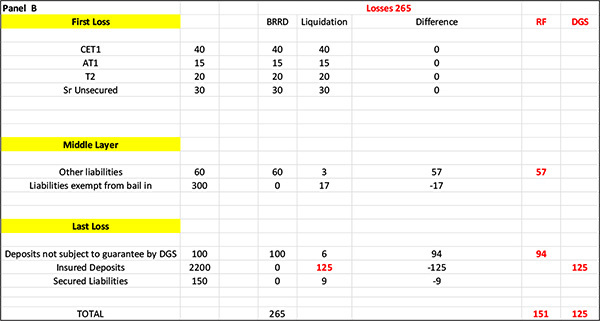 Then the EDIS covers all the liquidity needs and losses of the participating DGS. The time horizons for the mutualization of EDIS and the SRF coincide. In both cases, mutualization will be completed in 2024. Comparisons should stop there to the extent that EDIS is an insurance fund on which insured depositors will have a partial claim from 2020 and full claim in 2024. No bank creditor has a claim on the SRF. The economic rationale for the EDIS arises from the lack of risk diversification of national DGS and their vulnerability to large domestic shocks, in particular, shocks where both the sovereign and the national banking sector are perceived to be in a fragile situation. The history of State DGSs in the US is relevant in this regard, since numerous state guarantee funds particularly those of small states failed in the US at the beginning of the 20th century as result of their lack of diversification and their small size as compared to the banks´ losses (Thies and Gerlowski, 1989). In the euro area, EDIS will contribute to break the diabolical sovereign – bank loop and will also be fiscally neutral over time because its risks will be spread more widely and because private contributions will be raised over a much larger pool of financial institutions. However, the EDIS relies on the credibility of the backstops from the national DGSs. Member States whose fiscal position is compromised may be perceived as unable to provide a credible backstop to a national DGS. This would cause a negative spill over to other Member States, which could negatively impact depositor confidence and cause competitive distortions. 2.3 Would these mutualization mechanisms (SRF and EDIS) be sufficient? Neither the SRF nor the EDIS have a common fiscal backstop from the euro area. Recently, the IMF (2016) has advocated a common fiscal backstop such as a credit line from the ESM, for both the EDIS and the SRF.24)This solution is consistent with article 76 SRMR that already foresees that the SRB can “contract for the Fund financial arrangements, including, where possible, public financial arrangements, regarding the immediate availability of additional financial means […]” Such backstop would minimize the chances that bank-sovereign risk links would reemerge, which the IMF considers possible during the transition to becoming fully financed. In the IMF view, the ESM could be empowered to engage in the precautionary direct bank recapitalizations of viable banks in order to safeguard financial stability as allowed under BRRD, with the appropriate conditionality. Schoenmaker and Wolf (2015) shared the IMF view and went further by advocating that the ESM would be a suitable option for a common public backstop in both the transition phase and also in the steady state. Also, the common backstop should be fiscally neutral over the medium term because any public funds would be subsequently reimbursed over time by the banks via their ex post contributions. The repayment period would need to be realistic in order to prevent the creation of an unsustainable burden for European banks and avoid procyclicality.Indeed, a comparison can be drawn with the US FDIC, which traditionally has had ready access to a line of credit from the Treasury. The FDIC also has authority to borrow up to USD 100 billion for insurance losses from the U.S. Treasury. The law requires the banking industry to repay any FDIC funds borrowed from the Treasury over a period of several years (Ellis, 2013). Such capability was extended to USD 500 bill. by Title II of the Dodd-Frank Act (2010), which establishes a special insolvency regime under the Orderly Liquidation Authority (“OLA”) for SIFIs including bank holding companies, nonbank financial companies including insurance and broker dealers. FDIC may borrow from the US Treasury among other things, to make loans to, or guarantee obligations of, a covered financial company or a bridge financial company or to provide liquidity for the operations of the receivership and the bridge financial company. Tapping the backstop (USD 500 bill. of OLA) requires recommendations from super-majorities of the Board of Governors and the FDIC and a decision by the Treasury Secretary in consultation with the US President. Any public funds provided by the FDIC are to be given priority as administrative expenses of the receiver or as amounts owed to the US when used for the orderly resolution of banks. In the unlikely event that recoveries from the disposition of assets are insufficient to repay amounts owed to the US Treasury, there would be a subsequent assessment on the industry to repay those amounts. By law, no taxpayer losses from the liquidation process are allowed. An important distinction between the EU and US frameworks is that minimizing moral hazard is not an explicit objective in the EU, where resolution objectives include minimizing reliance on extraordinary public funds subject to State Aid rules.25)Communication from the Commission on the application, from 1 August 2013, of State aid rules to support measures in favor of banks in the context of the financial crisis (“Banking Communication”) (http://eur-lex.europa.eu/legal-content/EN/TXT/PDF/?uri=CELEX:52013XC0730(01)&from=EN accessed 12th August, 2016). In contrast, OLA specifically bars any losses to taxpayers and requires that all losses be borne by the failed company’s creditors or, if necessary, through contributions by other SIFIs (Krimminger and Nieto, 2015).The EU approach to bank recovery and resolution potentially raises concerns about moral hazard because high risks in a national banking sector are shared by other credit institutions in the euro area via the SRF and EDIS. Also, bank loses could be potentially shared amongst sovereigns if the EMS is used as a public backstop; hence, it is important to have a demanding SSM prudential supervision to break the sovereign-bank nexus as well as a strong EMU fiscal and economic institutional framework to secure the sustainability of public finances. Against this background, the current prudential treatment of banks that have large holdings of banks’ home sovereign exposures is at the center of the policy debate.26)The Netherlands EU Presidency 2016 made a priority the discussion on how to address this risk (http://english.eu2016.nl/documents/publications/2016/04/21/wisselwerking-landen–banken accessed on the 19th July). At the time of writing, the regulatory treatment of banks´ sovereign exposures has been passed over to the Basel Committee of Banking Supervisors. More stringent capital requirements for sovereign exposures would result in rebalancing of banks´ portfolios. Discouraging bank holdings of sovereign debt could have a significant impact on sovereigns´ financing costs and the sovereigns´ capacity for undertaking macroeconomic stabilization policies. Policy makers acknowledge this trade off and so the transition to the new regime is likely to be lengthy. Furthermore, it might be argued that the timing of the transition to the new bank regulatory framework of banks´ sovereign holdings should ideally coincide with the mutualization of EDIS and the SRF in the euro area. The mutualization of risks amongst banks and sovereigns would be ineffective without an incentive compatible decision making framework to deal with failed banks whose ultimate objective is not only to preserve financial stability but also to minimize the public costs of bank crises. The BRRD establishes common objectives for the first time for national resolution authorities in the EU: (i) to ensure the continuity of critical functions; (ii) to avoid significant adverse effects on financial stability, preventing contagion and protecting insured depositors, while at the same time minimizing the public and private costs of failed bank resolution.The BRRD general principles governing resolution are consistent with the objectives of limiting moral hazard and incentivizing market discipline amongst credit institutions, because shareholders take first losses; creditors bear the next losses after shareholders in accordance with their priority; senior management is replaced; creditors of the same class are treated in an equitable manner and no creditors incur greater losses that they would have incurred under liquidation.The BRRD also provides the Resolution Board and national resolution authorities with a broad range of powers and tools to effectively resolve a bank that reached the point of non-viability and has no reasonable prospect of a private or supervisory solution in the immediate future. The Directive harmonizes, for the first time, those powers and tools.In particular, the bail-in tool allows for (although it does not guarantee) an equitable burden sharing between investors in the bank and the exiting mutualization mechanisms in the euro area. The bail-in tool is a conservation mechanism to absorb the losses of institutions that are failing or likely to fail. The tool aims to save the bank from failure by absorbing its losses and recapitalizing it to above the regulatory minimum via equity conversion and / or the reduction of the principal amount of claims / debt in order to facilitate bank resolution. The BRRD establishes a minimum requirement for liabilities including own funds (Minimum Requirement of Eligible Liabilities –MREL), which have to be bailed-in before mutualization via SRF can contribute to the financing of bank resolution up to a limit also defined in terms of total bank liabilities (8%). The BRRD establishes a creditor hierarchy with certain ‘carve-outs.’ These carve-outs acknowledge the claim that secured creditors have to collateral pledged by the bank. They also grant preference to insured deposits, and allocates first loss capital instruments (common equity, Additional Tier 1, and Tier 2). Also, the application of the resolution tools goes hand in hand with the recovery and reorganization measures that are reflected in the Business Reorganization Plan that aim at restoring the bank long-term viability.Minimum bail-in, together with temporary financing from the SRF and a Business Reorganization Plan could allow systemically important institutions in the euro area to remain open and operating with potentially greater protection for creditors than the closed institution approach used in the US. Closed bank bail-in simply describes the FDIC’s long-standing process for resolving failed banks in which all creditors are “bailed-in” by having their claims impaired in proportion to the bank’s losses and the creditors’ seniority under the statutory claims hierarchy. Insured depositors are protected under FDIA, but uninsured depositors may suffer losses. Krimminger and Nieto (2015) argue that the greater flexibility under the EU resolution framework to take action to preserve a credit institution without putting it through an insolvency process raises the question to what degree the BRRD framework will significantly limit losses of a failed bank. Moreover, the cumbersome decision-making process that involves the SRB, the SSM, national resolution authorities, the Commission and the Council will not facilitate timely resolution decisions, particularly in emergency situations. Furthermore, such cumbersome decision making structure may provide an incentive for the SSM to forebear, which, in turn, may eventually result in larger ultimate claims on the SRF.In sum, it could be argued that the BRRD still leaves room for moral hazard in the form of risk taking by the crisis bank. The BRRD enshrines an administrative procedure for the recovery and orderly resolution of systemic credit institutions and investment firms that could not be liquidated without putting financial stability at risk. However, most banks in the euro area are not systemic and their liquidation would not threaten financial stability.27)EBA has recently published financial information of 36 large financial institutions whose leverage ratio exposure measure exceeded 200 billion Euro by the end of 2015 (see http://www.eba.europa.eu/documents/10180/1360107/EBA+Interim+report+on+MREL, accessed 10th August, 2016).In 2010, the Commission was planning to examine the need for further harmonization of bank insolvency regimes which fell outside the scope of the BRRD, with the aim of resolving and liquidating failing banks under the same substantive and procedural rules. Banks´ insolvency was then (and it is today) only bound by the principles of “universality” (all the bankrupt bank´s assets and the claims against these assets are treated equally regardless of their location) and “unity” (single set of proceedings, covering both the insolvent banks´ head office and its foreign branches in the EU -home country-) as well as the obligatory notification to others by the national authority initiating the bankruptcy process.28)Directive 2001/24/EC of the European Parliament and of the Council of 4 April, 2001 on the reorganization and winding up of credit institutions (OJ L 125, 5.5.2001). Note that financial institutions were excluded from the regulation harmonizing collective insolvency proceedings which entail the partial or total divestment of a debtor and the appointment of a liquidator. Council Regulation (EC) No 1346/2000 of 29 May, 2000 (OJ L 160 30.6.2000).The disparity of national regimes for dealing with banks´ bankruptcy within the EU could have a material impact on the financial position of national DGS. The impact would arise because of different contributions in case of payout events as well as contributions to resolution aimed at reducing the likelihood of future claims against DGSs. National regimes vary in their effectiveness regarding the pre insolvency processes; the timeliness in initiating the liquidation procedure; the priority that they grant for claims and the legal certainty that creditors´ face. The financial position of national DGS will be affected by such disparities, which may result in national differences in bank losses and the levels in which impairments affect claims.Figure 2 shows how differences in the priority of claims impact the DGS´s contributions to bank resolution and can reduce the amount that needs to be contributed by the resolution fund.29)Directive 2014/49/EU of the European Parliament and of the Council of 16 April 2014 on deposit guarantee schemes (L 173 / 149, OJ 12.6.2014): Role of DGS in resolution (Recital 3 ): “In view of the costs of the failure of a credit institution to the economy as a whole and its adverse impact on financial stability and the confidence of depositors, it is desirable not only to make provision for reimbursing depositors but also to allow Member States sufficient flexibility to enable DGSs to carry out measures to reduce the likelihood of future claims against DGSs. Those measures should always comply with the State aid rules…” See also, BRRD, Article 99. Panel A: Senior unsecured debt does not take first loss. Panel B: Senior unsecured debt takes first loss. Granting insured deposits preference greatly reduces the likelihood that they would incur losses. Accordingly, there is only a potentially limited risk that resolution will result in a claim on the deposit guarantee fund. This, in turn, should be a factor that reflects in any risk-based premiums levied on banks in order to finance the DGS (Huertas and Nieto, 2014). In sum, harmonization of bankruptcy laws is particularly relevant before the full launching of EDIS, which enshrines the progressive mutualization of liquidity shortfalls and excess losses on national DGS. Furthermore, because extreme tail risks always belong to the government, the impact of triggering such fiscal backstops on public accounts would challenge fiscal coordination in the euro area. 4. Conclusions: Will next time be different? The rules on readily available fiscally neutral public backstops for SRF and EDIS have not been defined for the steady state phase of SRF and EDIS. Deutsche Bank Research (2015). Deposit Insurance in the Banking Union. August 19, 2015. Eisenbeis, R.A. (2006). Home Country versus Cross-Border Negative Externalities in Large Banking Organization Failures and How to Avoid Them. Federal Reserve Bank of Atlanta Working Paper 2006-18, October, reprinted in Evanoff, Douglas D., Kaufman, G.G., and LaBrosse, J.R. (eds.) (2007). International Financial Instability: global banking and national regulation, World Scientific, New Jersey. Eisenbeis, R.A., and Kaufman, G.G. (2006). Cross-Border Banking: Challenges for Deposit Insurance and Financial Stability in the European Union. Federal Reserve Bank of Atlanta Working Paper 2006 -15a (revised January, 2007). Eisenbeis, R.A., and Kaufman, G.G. (2008). Cross-border Banking and Financial Stability in the EU. Journal of Financial Stability, 4 (3), 168-204. Ellis, D. (2013). Deposit Insurance Funding: Assuming Confidence. FDIC, Staff Paper (November, 2013). European Central Bank. ECB Annual Report (1999). Hardy, D., and Nieto, M.J. (2011). Cross-Border Coordination of Prudential Supervision and Deposit Guarantees. Journal of Financial Stability, 7, 155-164. Holthausen, C., and Rønde, T. (2005). Cooperation in International Banking Supervision. Center for Economic Policy Research Discussion Paper Series No. 4990. Huertas,T., and Nieto. M.J. (2014). How much is enough? The case of the Resolution Fund in Europe, Vox CEPR’s Policy Portal, 18th March, 2014 ( http://voxeu.org/article/ensuring-european-resolution-fund-large-enough accessed 11th August, 2016). International Monetary Fund (2016). Euro Area Policies: 2016 Article IV Consultation. IMF Country Report No 16/219, July 2016. Krimminger, M., and Nieto, M.J. (2015). Closing financial institutions on both sides of the Atlantic: Are there differences in approach? CEPS Commentary, 25 February 2015. Laeven, L., and Tressel, T., (2014). Fragmentation of the Financial System in Enoch, C., Everaert, L., Tressel, T., and Zhou, J.P. (Eds. ), From Fragmentation to Financial Integration in Europe, International Monetary Fund, 139-165. Nieto, M.J., and Schinasi, G. (2007). EU Framework for Safeguarding Financial Stability: Towards an Analytical Benchmark for Assessing its Effectiveness. International Monetary Fund, WP/07/260. Nieto, M.J., and Wall, L. (2015). Cross-Border Banking on the Two Sides of the Atlantic: Does It Have an Impact on Bank Crisis Management? Federal Reserve Bank of Atlanta, WP 2015-11, November. Schadler, S. (2014). The IMF’s preferred creditor status: Questions after the Eurozone crisis. Vox CEPR’s Policy Portal 28th April, 2014 http://voxeu.org/article/imf-preferred-creditor-status-and-eurozone-crisis (accessed 18th July, 2016). Schoenmaker, D. (2010). Do we need a separate resolution fund? Vox CEPR´s Policy Portal, 14 January, 2010 http://www.voxeu.org/index.php?q=node/4487 (accessed 18th July, 2016). Schoenmaker, D., and Wolf, G. (2015). Options for European Deposit Insurance. Vox CEPR´s Policy Portal, 30 October, 2015. http://www.voxeu.org/article/options-european-deposit-insurance (accessed 18th July, 2016). Thies, C.F., and Gerlowski, D.A. (1989). Deposit Insurance: A history of failure. Cato Journal, 8 (3, Winter 1989). 2. ↑ Deposit insurance measures the credibly committed and expected amount of assistance (“commitment technology”) that a country may have to deploy to ensure that support for claimants of a failed bank is limited to the predetermined deposit guarantees. 3. ↑ Council Regulation (EU) No 1024/2013 of 15 October 2013 conferring specific tasks on the European Central Bank concerning policies relating to the prudential supervision of credit institutions (OJ L287, 29-10-2013). 4. ↑ Regulation (EU) No 806/2014 of the European Parliament and of the Council of 15 July 2014 establishing uniform rules and a uniform procedure for the resolution of credit institutions and certain investment firms in the framework of a Single Resolution Mechanism and a Single Resolution Fund and amending Regulation (EU) No 1093/2010 (OJ L 225, 29-7-2014) (Henceforth SRMR). 5. ↑ As outlined in the Communication from the Commission to the European Parliament and the Council ‘A Roadmap towards a Banking Union’(COM(2012) 510, 12.9.2012), in the Communication from the Commission ‘A Blueprint for a Deep and Genuine Economic and Monetary Union Launching a European Debate’ (COM(2012) 777 final/2, 30.11.2012) and in the Four Presidents’ report ‘Towards a genuine economic and monetary union’ (Report by President of the European Council, Herman Van Rompuy EUCO 120/12, 26.06.2012). 6. ↑ Proposal for a Regulation of the European Parliament and of the Council amending Regulation (EU) 806/2014 in order to establish a European Deposit Insurance Scheme. COM (2015) 586 Final. Strasbourg 24-11-2015. 7. ↑ See ELA procedures at http://www.ecb.europa.eu/mopo/ela/html/index.en.html (accessed 14 July, 2015). 8. ↑ Banking Union is compulsory for the euro area countries and optional for the rest of the EU countries. 9. ↑ Resolution tools are defined in the Directive 2014/59/EU of the European Parliament and of the Council of 15 May 2014 establishing a framework for the recovery and resolution of credit institutions and investment firms and amending Council Directive 82/891/EEC, and Directives 2001/24/EC, 2002/47/EC, 2004/25/EC, 2005/56/EC, 2007/36/EC, 2011/35/EU, 2012/30/EU and 2013/36/EU, and Regulations (EU) No 1093/2010 and (EU) No 648/2012, of the European Parliament and of the Council (L 173/190, OJ 12.6.2014) (Henceforth BRRD). 10. ↑ Title II of the Proposal for a Regulation of the European Parliament and of the Council amending Regulation (EU) 806/2014 in order to establish a European Deposit Insurance Scheme. COM (2015) 586 Final. Strasbourg 24-11-2015. 11. ↑ In the case of EDIS, however, the decision to assess whether the conditions for the provision of liquidity and loss cover are met corresponds entirely to the Board, which determines the amount of funding. 12. ↑ See ESM Treaty at http://www.esm.europa.eu/pdf/esm_treaty_en.pdf (accessed 14 July, 2016). 13. ↑ In the case of Spain, it was the first time the instrument of recapitalization of banks through loans granted to a government was used. There were no contributions from other lenders. Spanish authorities requested financial assistance from the European Financial Stability Facility (EFSF) to support the ongoing restructuring and recapitalization of its financial sector. The program concluded as scheduled in January 2014 and the total financial assistance required was € 38.8 bill. The program consisted of 32 measures, which included institutional and regulatory changes that had to be completed in eighteen months. 14. ↑ The rise in EFSF spreads relative to the spreads of its Aaa-rated guarantors reflected limits of the EFSF’s ability to support European government bond markets. The movement of the spread of other Aaa-rated euro area countries to Bunds explained only 30% of the increase in the spread on the EFSF issuance. Furthermore, while the EFSF bond spread remained significantly lower than the weighted average spread of all its guarantors, it had moved further away from the AAA guarantors spread and closer to the all-member spread during the last six months of 2011 (Moody´s 2011). 15. ↑ See Schadler (2014) for an analysis of the IMF preferred creditor status. 16. ↑ Agreement on the transfer and mutualization of contributions to the Single Resolution Fund. 17. ↑ See http://www.consilium.europa.eu/en/press/press-releases/2015/12/08-statement-by-28-ministers-on-banking-union-and-bridge-financing-arrangements-to-srf/?utm_source=dsms-auto&utm_medium=email&utm_campaign=Statement+on+Banking+Union+and+bridge+financing+arrangements+for+the+Single+Resolution+Fund accessed 10th August, 2016. 18. ↑ The aggregate amount and the repartition key will be reviewed by the end of 2017 or earlier, if a non-euro area Member State joins the Banking Union. 19. ↑ European Commission (2015) Completing Europe´s Economic and Monetary Union Report by J. C. Junker, D. Tusk, J. Dijsselbloem, M. Draghi and M. Schultz. 20. ↑ The payout event could be the result of a “liquidity shortfall” or a “loss cover” of the participating DGS. 21. ↑ When using resolution tools (bail-in…) for the amount of losses that covered depositors would have suffered, if they would have suffered losses in proportion to the losses suffered by creditors with the same level of priority (i.e. unsecured debt) under normal insolvency procedures. The liability of DGS shall not exceed the losses it would have incurred under normal insolvency. 22. ↑ Proposal for a Regulation of the European Parliament and of the Council amending Regulation (EU) 806/2014 in order to establish a European Deposit Insurance Scheme. COM (2015)686 final. 2015/0270 (COD). Strasbourg 24.11.2015 (Article 41q). 23. ↑ 20% in year 1; 40% in year 2; 60% in year 3; 80% in year 4. 25. ↑ Communication from the Commission on the application, from 1 August 2013, of State aid rules to support measures in favor of banks in the context of the financial crisis (“Banking Communication”) (http://eur-lex.europa.eu/legal-content/EN/TXT/PDF/?uri=CELEX:52013XC0730(01)&from=EN accessed 12th August, 2016). 26. ↑ The Netherlands EU Presidency 2016 made a priority the discussion on how to address this risk (http://english.eu2016.nl/documents/publications/2016/04/21/wisselwerking-landen–banken accessed on the 19th July). At the time of writing, the regulatory treatment of banks´ sovereign exposures has been passed over to the Basel Committee of Banking Supervisors. 27. ↑ EBA has recently published financial information of 36 large financial institutions whose leverage ratio exposure measure exceeded 200 billion Euro by the end of 2015 (see http://www.eba.europa.eu/documents/10180/1360107/EBA+Interim+report+on+MREL, accessed 10th August, 2016). 28. ↑ Directive 2001/24/EC of the European Parliament and of the Council of 4 April, 2001 on the reorganization and winding up of credit institutions (OJ L 125, 5.5.2001). Note that financial institutions were excluded from the regulation harmonizing collective insolvency proceedings which entail the partial or total divestment of a debtor and the appointment of a liquidator. Council Regulation (EC) No 1346/2000 of 29 May, 2000 (OJ L 160 30.6.2000). 29. ↑ Directive 2014/49/EU of the European Parliament and of the Council of 16 April 2014 on deposit guarantee schemes (L 173 / 149, OJ 12.6.2014): Role of DGS in resolution (Recital 3 ): “In view of the costs of the failure of a credit institution to the economy as a whole and its adverse impact on financial stability and the confidence of depositors, it is desirable not only to make provision for reimbursing depositors but also to allow Member States sufficient flexibility to enable DGSs to carry out measures to reduce the likelihood of future claims against DGSs. Those measures should always comply with the State aid rules…” See also, BRRD, Article 99.